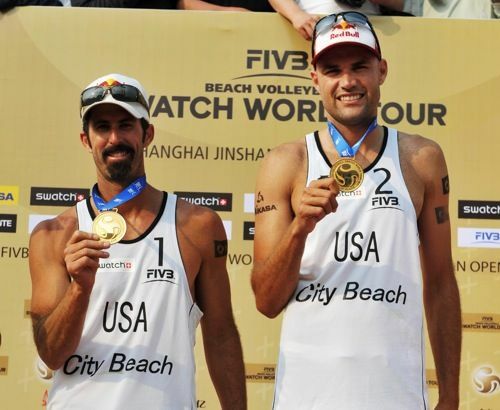 Todd Rogers (left) and Phil Dalhausser have already won one gold in 2012, at the Brasilia Open (photo courtesy FIVB). The 2012 FIVB Swatch World Tour steps up the pace with the first Grand Slam tournament of the Olympic year at the Shanghai Grand Slam presented by Jinshan Xinchen. After Open tournaments in Brasilia and Sanya for the women and Brasilia and Myslowice for the men, the Shanghai Grand Slam signals the first of eight Grand Slam tournaments in 2012. Defending champions Todd Rogers and Phil Dalhausser started the year with a bang by winning gold in Brasilia, then sat out the Silesia Open in Myslowice, Poland. Now they will seek to make it two tournament victories from two with a second gold in Shanghai. The US pair will be out to use the tournament to build momentum ahead of the defence of their Olympic crown later in the year at London’s Horse Guard’s parade. Their big rivals for the Olympic title – 2011 world champions Emanuel and Alison – also missed the Silesia Open after they finished seventh in Brasilia when Alison was forced out of their match with Dalhausser and Rogers with an arm injury. Victory in Myslowice went to another Brazilian duo. Ricardo Santos and Pedro Cunha beat compatriots Marcio Araujo and Pedro to the gold. It represented their third victory in seven tournaments since they paired up. One other pair determined to get their 2012 season going is 2009 world champions Julius Brink and Jonas Reckermann. The German pair have good memories of the 2011 tournament, after they won the bronze medal.